Yahoo has announced that it is to close its GeoCities service later this year. The web-hosting site, which offers free to low-cost hosting accounts, was bought by Yahoo back in 1998 for $3.57 billion. Despite a deluge of similar sites hitting the web since then, and a significant drop in cost to host a website, GeoCities managed to attract around 177 million visitors in 2008. 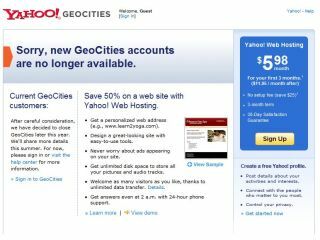 "We have decided to discontinue the process of allowing new customers to sign up for GeoCities accounts as we focus on helping our customers explore and build new relationships online in other ways," says Yahoo in the Customer Help section of its website, concluding with "we will be closing GeoCities later this year." Although the website is closing, Yahoo is asking users to migrate to its other free service 'Yahoo! Web Hosting'. Yahoo insists that website information will be safe until the summer but does mention that it will update users on how to "save your site data" before the impending switch-off.